Condo, 1	Bedrooms, 1 Baths, Sleeps 2. Great Location for a Wonderful Relaxing Get Away !!! Once You Visit You'll Want To Stay ( Forever) !!!!!!!!! Newly renovated (2016), non-smoking, fully furnished one bedroom condos are located in quiet Sunset Beach, on the Intercoastal, across a residential street from the beach. These brightly decorated units have a private/direct beach access, and offer all the comforts of home. 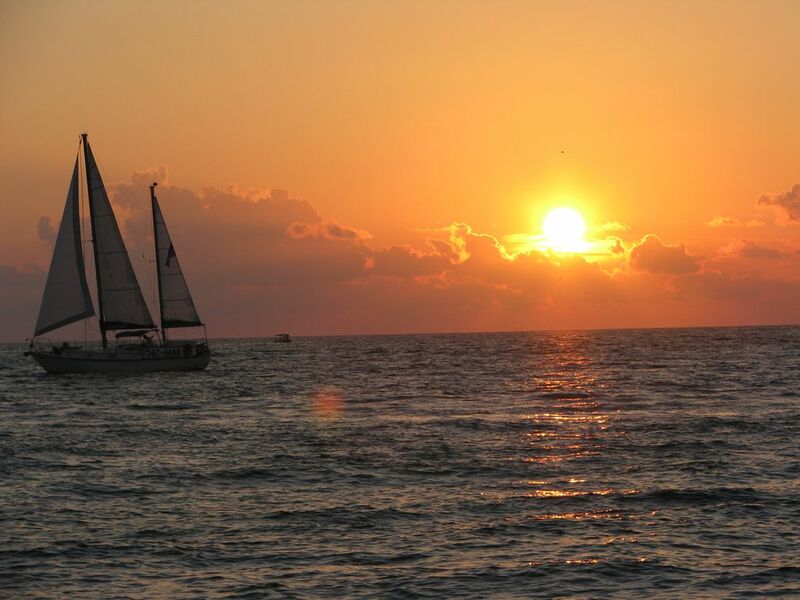 Enjoy beautiful sunsets, romantic walks on the beach, in a relaxed tropical atmosphere. This is a great place to relax and get away from it all, while still being very close to restaurants and nightlife activities. We are originally from Northeast Ohio, relocated to Virginia in 2007, recently retired and relocated to Florida. We have been vacationing here since 1985 and in 2000 we purchased our first unit. Our children were very young when we first started coming down and now we see our 4 grandchildren enjoying this piece of Heaven. This is a very relaxing place as it is located in a more residential area away from all the busy and touristy areas but you are only about 5 min. away if this is where you want to be. Shopping and many good restaurants are close by. If ""Living On Island Time" is the way you like to spend your vacation, you can make it as busy or as relaxing as you want it to be. The sunsets are incredible and never the same. There are different paintings in the sky every evening. Sitting at the dock watching the manatee and dolphins is a sight for young and old. The walks on the beach will bring many shells to your collection and never 2 the same. Downtown St. Petersburg is just a short distance away. You can take the trolly which drops you off right on Beach Dr. Many shops and good restaurants makes for an enjoyable day or evening. A short 52 steps to the white sand beaches of the Gulf Of Mexico through our private beach access. The beach is never crowded and it's a terrific place to sit back and unwind. Large patio area with dock grills and picnic tables. We were very comfortable in the condo--just like home. Even had a crockpot that I used. They were kind enough to have things you need like: a bar of bath soap, laundry detergent-that we didn't use, tin foil and baggies, salt/pepper, etc. They also provided beach towels, chairs, umbrella, and much more. But the very best part was the Sunset! We stayed for over 2 weeks-almost every night I walked the beach and watched the show. Amazing colors. I also have to add that the other people at the complex were very warm and friendly! I highly recommend this property. My husband and I stay 10 days in this property, it was amazing. We had a very positive experience. Our hosts, Georgia and Mike, were wonderful. We were hesitant prior to arriving as there was a storm in the area, I called Georgia and she reassured me that we would be okay. I am glad I did not cancelled my trip. The apartment is beautiful, small, but you do not miss anything. It is a full size apartment. King size bed is very comfortable, the apartment is very clean, and everything in it is new. The apartment was recently remodeled and the best part is that is just a matter os crossing the street and you are at a private beach. There is also a swimming pull in case you don’t feel like getting sands in your feet. Georgia surprised us with her visit one afternoon. It was a pleasure to meet her. Oh, when we arrived, we found a pie they left for us. This was a wonderful experience. I recommend this place 100%. Our Visit to Sunset Beach was very relaxing the Condo was beautiful small but comfortable, everything we needed was available. Mike and Georgia were very helpful down to places to eat. Only problem was the fact they were working on the beach so we didn't get to spend much time there. Thank you for your review. We are happy that you enjoyed your stay. We're sorry that your beach time was cut short, but the storms that we had in 2017 took a toll on the beach, and refurbishment was necessary. This work was just completed this week, and the beach is big and beautiful once again. We look forward to hosting you again in the future. Everything you want and need in one place! We truly enjoyed our stay at Sunset Cove number 11S. Beautiful furnishings along with all the supplies you need to make your vacation complete. The pool is perfect and only steps to the beach for amazing sunsets. Thank you Georgia and Mike for the great recommendations for local bars and restaurants. We highly recommend Almost Heaven. My theme of the trip was Solo Because Yolo since I was traveling alone. The condo was beautiful, Zen, perfect! The beach is literally steps away, the pool was great and everyone was so kind. I enjoyed it so much, I cannot wait to come back! Condo at Sunset Cove is perfect! You will find churches, restaurants, supermarkets, shopping, water craft rentals, parasailing, deep sea fishing, museums, arts and theater, golf courses, tennis, bicycle and scooter rentals are all within a short distance of the condo. Tampa International Airport is within a 40 minute drive and St. Petersburg/Clearwater airport is within a 30 min. drive. Although a car is recommended, it is not absolutely necessary, as there is trolley service from Treasure Island to Clearwater Beach, Downtown St. Petersburg, and St. Petersburg Beach. Local hospital and urgent care facilities located within a ten minute drive. Florida State and local county tax of 13% will be applicable One-time cleaning fee of $65.00 Cleaning. Fee. $65.00 13% Florida State Tax $250.00 Security Deposit _________________ $250.00 deposit is due upon confirmation of rental stay. Your deposit will be refunded within 30 days of your departure.